Maps and globes fascinate me. And the map of the Grid is especially interesting to me. 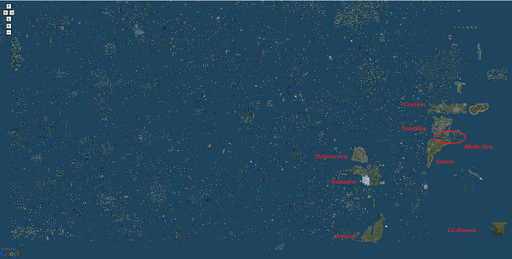 When I look at the Grid I see a vast ocean with thousands of islands. And when I see that ocean my thoughts turn to boating and exploring. But the reality is, most of those open blue areas aren’t passable ocean; very few areas on the grid are inter-connected. Look how small even the mainland continents are. I believe the JY sims are to the west in the vastness. The Grid was on my mind a couple weeks ago when I decided to go boating around the Junkyard Blues sims. The Junkyard is a well designed community of twelves sims with 10 outer sims forming it’s own little sea and helping make this area a wonderland by most SL standards. But as I struggled with sim crossings (sim crossings are a chronic problem everywhere), I thought about how cool it would be to turn the boat to northeasterly course, and make my way home to the New England islands. 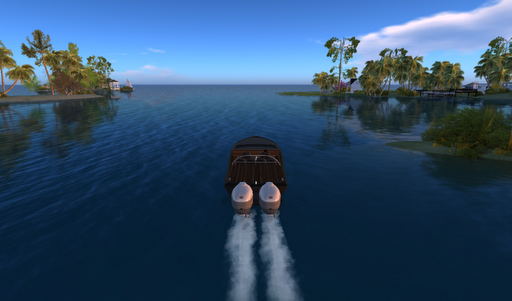 Boating around the Junkyard sims in The Biscuit. For people who want private little islands, the lack of inter-island connection is a good thing. But for those of us who seek the openness of the seas, it means the vast world of the Grid is so much smaller than it could be. Still, when you look ahead of you, it doesn’t take much to imagine what might lay just up ahead. but instead thought about heading home by sea. 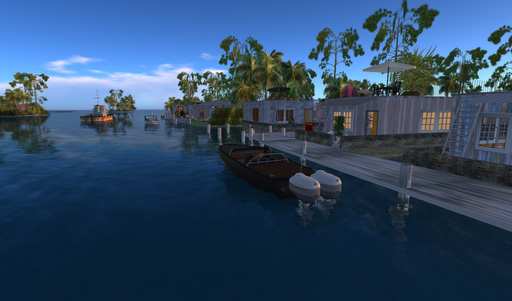 This entry was posted in Exploring and tagged Boating, Exploring, Photography, Second Life. Bookmark the permalink.